While it’s doubtful that anyone ever travelled to Malta exclusively for its wines, that doesn’t mean that there aren’t any good ones there. After all, winemaking began on Malta with the Phoenicians (roughly 500 BC) and perhaps even earlier. Even though it never grew into a major factor in the Maltese islands – too many interruptions in Malta’s much-checkered history – winemaking remained a steady presence on the island, and in the late twentieth century began growing in seriousness and importance. 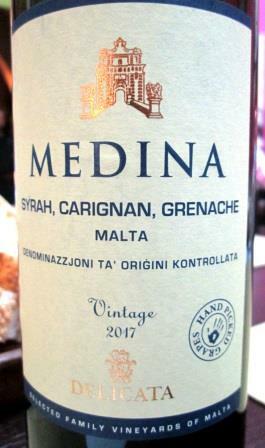 So when Diane and I ventured to Malta and its sister islands for a brief vacation, we found plenty of enjoyable bottles to accompany the interesting native cuisine. Red wines are pretty much what you would expect from such a southern locale: Syrah, Grenache, Carignane appear frequently, individually or blended, and there is also a lot of the Cabernets and Merlot, though for my palate they are less adapted to the often spicy Maltese meat menu than the Rhône valley varieties. We found it difficult to find examples of the indigenous varieties. Most of the wine encyclopedias that I’ve checked claim there are three: the white grapes Girgentina and Gennarua and the red Gellewza. 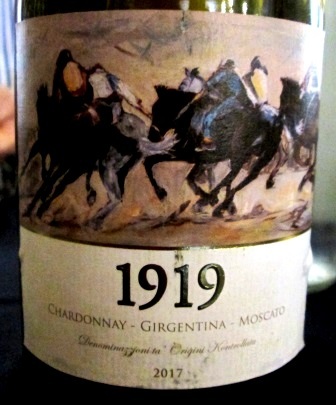 Only a few traditionalists seem to have any faith in these varieties’ ability to produce quality wine, and we were unable to locate monovarietal bottlings of any of them, hence can say little about their individual character and quality. We did taste Girgentina and Gellewza in interesting blends, however. From our experience (admittedly far from thorough), we’d have to conclude that Gennarua has completely dropped out of commercial production. 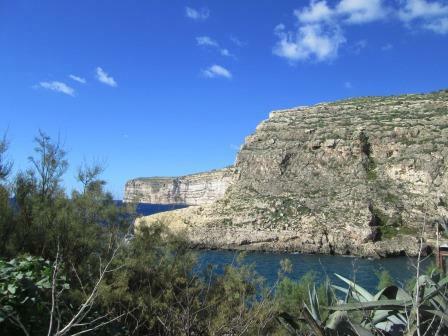 As for producers, Malta has three major ones, all relatively small by continental standards. 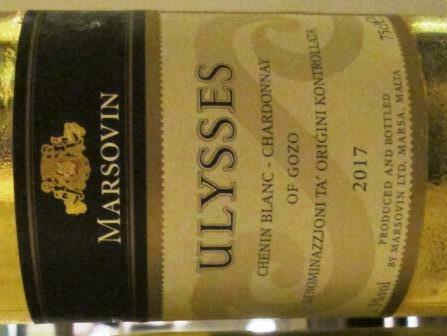 Marsovin, the biggest, works exclusively with continental varieties. Delicata draws its grapes from a network of small local growers and from Italian imports. Meridiana, the newest player, was established in 1994 on the grounds of a former British airbase. It too works mostly with international varieties. That’s the basic situation of Maltese wine. Here are a few sensory impressions of the wines we were able to taste. None of these is very likely to make it to US shores in the foreseeable future, but who knows?! A Rhône-ish blend of Syrah, Grenache, and Carignane. Nose and palate reminiscent of Châteauneuf du Pape, with limestone notes. Medium-bodied and very young; quite pleasant, but really needs some time. Gellewza and Shiraz. Very sprightly and youthful, suggesting a Beaujolais, but rounder, more tannic, and less acidic. Quite enjoyable. A blend of Girgentina, Chardonnay, and Moscato. Full-bodied, dry and crisp, with some depth. Very interesting wine, excellent with Maltese seafood soup and grilled calamari. A numbered, limited release of selected Cabernet sauvignon and Cabernet franc, aged in oak – Marsovin’s elite production. Despite its youth and oak-aging, this 2016 was quite drinkable, with the wood sweetness well under control and the varietal flavors beginning to emerge. Chenin blanc and Chardonnay, from the island of Gozo. Big-bodied, round, dinner wine, showing a lot of Chenin chalky flavor. A blend of Vermentino, Viognier, and Chardonnay. Light-to-medium body, bone dry. A pleasant, aperitif-style white. 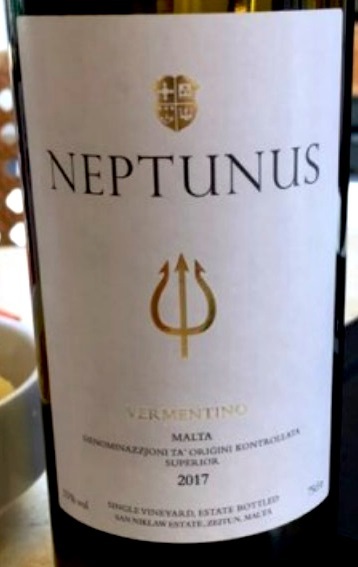 A single-vineyard Vermentino, one of the best wines we drank on Malta. 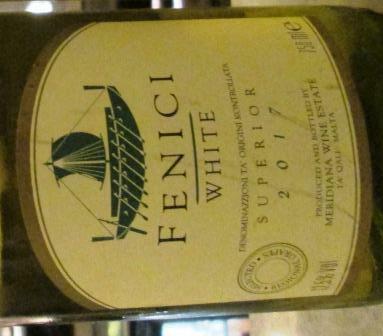 Big and powerful, with a wonderful nose, rich on the palate, fine acidity, and plenty of Vermentino character; great with the local seafood. 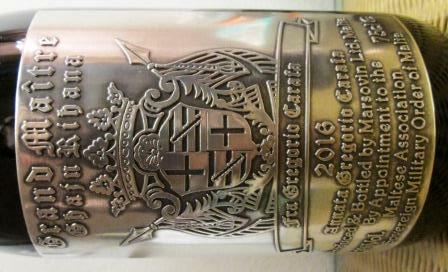 At a special luncheon on Gozo, we enjoyed a 2014 bottle with much more developed flavors, maturing quite nicely. 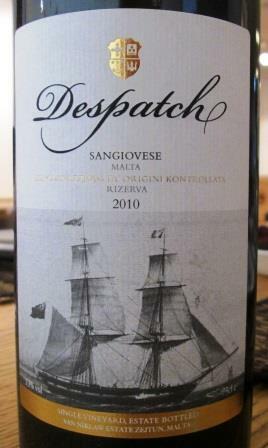 The best red wine we had on Malta, with lovely Sangiovese character, maturing beautifully. 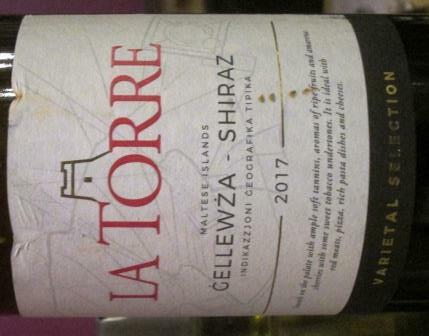 We enjoyed it at that same special luncheon on Gozo, whose two wines furnished clear proof that Malta is capable of first-class wines – though, of course, the supply will always be intensely limited, given the tiny size of the islands.